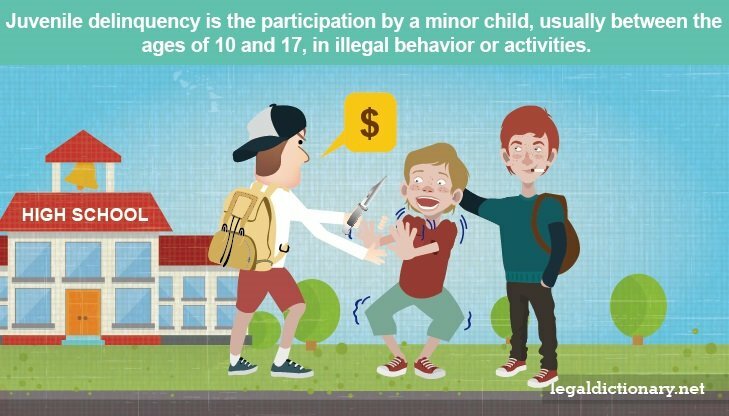 Juvenile delinquency is the participation by a minor child, usually between the ages of 10 and 17, in illegal behavior or activities. Juvenile delinquency is also used to refer to children who exhibit a persistent behavior of mischievousness or disobedience, so as to be considered out of parental control, becoming subject to legal action by the court system. Juvenile delinquency is also known as “juvenile offending,” and each state has a separate legal system in place to deal with juveniles who break the law. To explore this concept, consider the following juvenile delinquency definition. noun. The behavior of a minor child that is marked by criminal activities, persistent antisocial behavior, or disobedience which the child’s parents are unable to control. 2. noun. A violation of the law by a minor, which is not punishable by death or life imprisonment. Juvenile delinquency occurs when a minor violates a criminal statue. When a juvenile commits a crime, the procedures that take place differ from those of an adult offender. In all states, juvenile court systems, and juvenile detention facilities, deal specifically with underage offenders. While it is common for state statutes to consider people under the age of 17 as minors, the justice system can charge minors even younger as adults, if the crime committed is very serious. Juvenile delinquents are often defined as children between the ages of 10 and 17 who have committed a criminal act. There are two main types of offenders: repeat offenders and age specific offenders. Repeat offenders are also known as “life-course persistent offenders.” These juvenile delinquents begin offending or showing other signs of antisocial behavior during adolescence. Repeat offenders continue to engage in criminal activities or aggressive behaviors even after they enter adulthood. This type of juvenile delinquent behavior begins during adolescence. Unlike the repeat offenders however, the behaviors of the age-specific offender ends before the minor becomes an adult. The behaviors that a juvenile shows during adolescence are often a good indicator of the type of offender he will become. While age-specific offenders leave their delinquent behavior behind when they enter adulthood, they often have more mental health problems, engage in substance abuse, and have greater financial problems than adults who were never delinquent as juveniles. Many children garner the label of juvenile delinquent early, often between the ages of 6 and 12 years. Many juvenile behaviors during the pre-teen and teenage years may be considered normal behavior for children, as they stretch their boundaries, and struggle to develop their self perception. There are, however, certain signs that a child might be headed in a bad direction. Peer Association – usually resulting from leaving adolescents unsupervised, encouraging a child to engage in bad behaviors when acting with his peer group. Permissive Parenting – characterized by lack of consequences for bad behavior, permissive parenting can be broken down into two subcategories: (1) neglectful parenting, which is a lack of monitoring a child’s activities, and (2) indulgent parenting, which is the enablement of bad behavior. If dealt with informally, the minor reports to a probation officer, and is given advice and ordered to perform community service, pay fines, attend treatment, or enter probation. Plea Agreement – the minor may enter a plea agreement with the court. This often requires the juvenile to comply with certain conditions, such as attending counseling, obeying a curfew, or paying restitution. 2. Diversion – the judge may divert the case, which means he retains control over the matter until the juvenile successfully completes treatment programs or performs community services. If the juvenile fails to comply, formal charges may be reinstated. 3. Adjudicatory Hearing – the judge may decide to have an adjudicatory hearing, which is a trial in a juvenile case. While both sides argue the case and present evidence, a juvenile trial takes place in front of a judge, not a jury. If, at the end of the hearing, the judge decides the juvenile is delinquent, he may order punishments such as probation, community service, or even detention in a juvenile center. The availability of education, and encouragement of minors in obtaining an education, plays a large role in prevention of juvenile delinquency. This is because education promotes social cohesion, and helps children of all ages learn to make good choices, and to practice self-control. The Office of Juvenile Justice and Delinquency Prevention (“OJJDP”) is just one agency that sinks resources into researching juvenile delinquency, and providing both prevention and rehabilitation programs. The agency also works toward reducing under-age substance abuse, and gang influence on minors. In 2012, police arrested 182 violent juvenile offenders for every 100,000 juveniles. Youth engaging in illegal behavior is a rampant issue, though most of those juvenile delinquents manage to turn their lives around, and become a productive and happy member of society. Actor Mark Wahlberg grew up one of nine children in a three-bedroom apartment. Though successful in today’s world, he had his fair share of trouble with the law as a minor. At the age of 14, Wahlberg joined a gang, and remained on law enforcement’s radar until he was locked up at the age of 16, with offenses such as drug dealing and assault. Wahlberg had attacked two men, blinding one. Having been originally charged with attempted murder, the charges were later reduced to criminal contempt, for which Wahlberg served only 45 days in a correctional facility. After being discharged from the correctional facility, Wahlberg decided to follow in the shoes of his older brother, Donnie, who had earned fame as part of “The New Kids on the Block.” Mark Wahlberg got a record contract heading up the musical group “Marky Mark and the Funky Bunch,” and put his life back on course. Wahlberg now has a family with four children, and lives a life dedicated to them, as well as to a number of charity causes. Wahlberg’s 1993 debut into acting has seen him become one of the most popular actors in and he has a long list of TV and big screen credits to his name. Offender – A violation of law or rule, the committing of an illegal act.